Dr. Joseph Rives, vice president for Quad Cities and planning, introduces the new program. MOLINE – Western Illinois University-Quad Cities announced its first School of Agriculture dual-enrollment course offering in a press conference today (Wednesday, March 28) on the WIU-QC campus in Moline. The new program was established through a gift from The Moline Foundation, which will allow Quad Cities-area high school students to take courses in agriculture completely free of tuition. 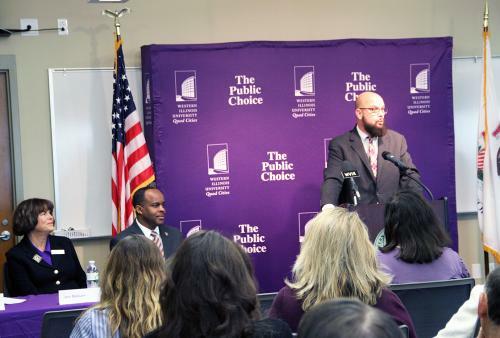 WIU President Jack Thomas and other University officials unveiled the multi-year pilot program, which will be offered starting in Fall 2018, noting that it not only establishes an "agricultural foothold" at the Quad Cities campus, but also, provides educational opportunity for students and meets needs of area employers. "With our expanded Quad Cities campus, located in one of the most significant population centers in this region, Western is positioned to offer students the emerging and relevant educational programs needed by our area employers," Thomas said. "In partnership with area high school educators, Western Illinois University feels the time is right to engage the Quad City-area urban high school students in a dual enrolled agriculture class. The Moline Foundation's support of this pilot program is an investment into our community's most important indicator of future economic success, the education of our area residents." The $100,000 gift supports the multi-year pilot program for high school students to dual enroll in three-credit-hour classes focused on agriculture. The Fall 2018 course offering is scheduled as Horticulture 180. The Moline Foundation gift provides for all registration fees, books, labs and tuition. Thomas noted that while WIU has previously offered dual-enrollment opportunities, this development enriches the University's offerings as outlined by the President's Executive Institute. Joseph Rives, Vice President for Quad Cities and Planning, noted that the gift directly supports local talent development goals included in the Quad Cities Chamber of Commerce's Q2030 Regional Action Plan. Joy Boruff, president and CEO of The Moline Foundation, noted agriculture is the number one industry in both Illinois and Iowa in terms of economic impact, with one in four jobs in the Quad Cities relating to agriculture. "Clearly, there is an opportunity to educate our future workforce about the growth and availability of jobs and careers in this sector," Boruff said. For more information, contact Andrew Baker, director of the WIU School of Agriculture, at AJ-Baker@wiu.edu or (309) 298-1080; or visit wiu.edu/cbt/agriculture or molinefoundation.org.